Information on our home ground, Palmerston Park. 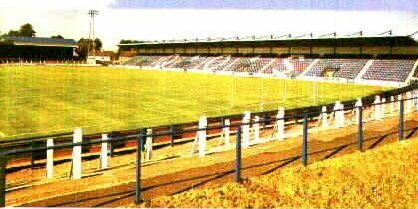 It may not look much, but you should see Stair Stadium, Stranraer! The Main Stand runs along most of the length of one side of the pitch. It is quite an old wooden stand but is well covered and is in good condition. It is quite a large stand by Scottish Second Division standards holding about 1,500 people. In the right hand side of this stand is the director's box, and this is therefor a popular area for the local hecklers. In front of the stand is a small standing enclosure which is a good place to stand if you want to be near the dug out to shout at the managers. The Terregles Street end of the ground (to the right of the main stand) is an uncovered terrace which is closed at present (only opened for big away support). A new stand occupies the opposite side of the pitch across from the Main Stand. If you know Palmerston from the old days, this stand has replaced the old cow shed. The stand holds about 2,200 and is a very impressive building. The final end of the pitch is a covered terrace holding around 3,000. It is usually reserved for home fans only. As of summer 2005 building work on a new stand is supposed to start here, to be followed by another one at the other end (still pending!!!). As of season 2013/2014, Palmerston Park will have a new 3G artificual surface. Approx 1000 but can use all of new stand if necessary.